make a first-aid kit or purchase one to keep readily available. Know where you can take your animals, and make sure to have a second or even third place to go in case the first one is full or has been evacuated. If you work, make arrangements with neighbors or someone else who could take over in case you can’t get back to your house during an evacuation. If you have enough warning, call ahead to make sure you can bring your animals to the location you plan to go to. To further make any emergency evacuation easier, if at all feasible, do some practice drills with your family and your animals. 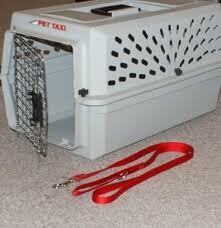 Get your animals use to being in the vehicle or whatever type of transportation you plan to use, even walking. Have the pet bug out bags ready to go and close to the door that you will be vacating the house through. Make it a habit to hang leashes where they will be readily available. 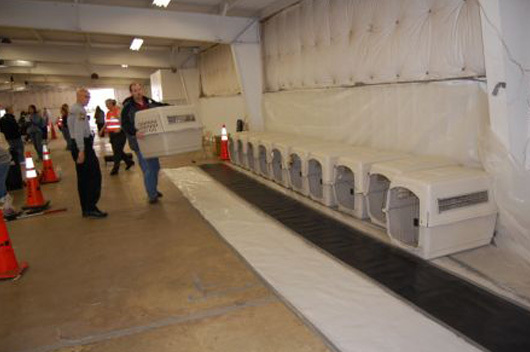 If you will be using a crate to transport your animals, have your pet bug out bags stored in it by the door so everything will be together and you will not have to spend frantic minutes trying to locate anything. With livestock that is halter broke, make sure halters and lead ropes are easily accessible and you have enough for each animal, plus an extra or two in case one breaks. Remember, if you plan ahead and are prepared, you will be able to handle an emergency with much less panic than if you had not planned at all. This entry was posted in dog health and tagged animal safety, disaster plan for pets, dog safety, emergency pet evacuations, emergency planning with pets, evacuating dogs in an emergency, evacuating pets, handling dogs in an emergency, how to prepare your dog for an emergency, keep your animal safe in an evacuation, pet bug out bag, pet emergency planning, pet evacuation in emergency, planning for emergencies with pets, planning for emergency pet evacuation, what to do with your dog in an emergency. Bookmark the permalink.